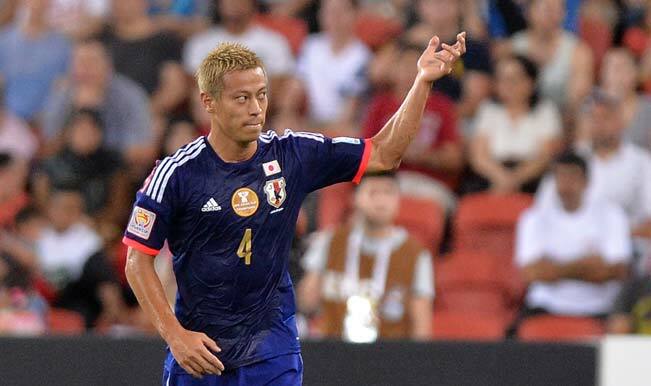 Ever since 2010 when he exploded onto the world stage at the World Cup in South Africa, Keisuke Honda has been put up on such a pedestal of genius back in his home country that he’d have been expected to be gracing the top pitches of Europe for the decade to come. Fast forward five years and you could argue that he hasn’t yet hit those lofty heights. However, we’re here to look back at a calendar year, and despite many assuming it has been just another average year for Honda, we’ll illustrate that he’s had quite a profitable 2015, especially in the colours of the Samurai Blue. The statistics back this up to the hilt. In 14 matches for Japan, Honda has registered a goal in 10 of them, and out of those four where he missed the target, Japan went onto lose three (their only defeats of the year). When he plays well for the national team he invariably scores, when he’s off form or left a frustrated figure (as we all reminisce back to a forlone World Cup 2014 campaign) Japan lack that cutting edge. Ever since his integration into the national starting line-up, his unique persona and attributes alongside his peers has led to greater success for both his team and himself individually. The Samurai Blue continue to develop quick, incisive, “tiki taka” players, but those in the Honda mould; enigmatic, adept from distance and, most importantly, decisive in front of goal remain few and far between. His flexibility has also proved invaluable to the cause, if not for his own. Under Aguirre at the start of the year, Honda was shifted to an unfamiliar right of a front three role, a position he excelled in at the Asian Cup, making his way into many of our SFG contributors’ team of the tournaments. Since Aguirre’s exit, Honda has yet again shown his flexibility in being able to be played in all three attacking roles in a 4231 deployed by the incoming Halilhodžić. Despite his constant run of form, the question remains rife amongst national team followers as to where’s best to place Honda; as Japan’s central playmaker or out on the periphery of the attack? Much of this is due to his competition in the form of Shinji Kagawa, who despite an upturn in form domestically continues to frustrate internationally. Oh, how their years have polarised each other. While Kagawa has run riot with Dortmund, Honda has trod a frustrating path at AC Milan. For years, while he flirted with mainstream European attention at CSKA Moscow, it was seen as only a matter of time before he made a name for himself in a so-called big league. While Milan was a big name to pick, their circumstances have hardly helped Honda since. Countless managers, which Honda himself has bemoaned in interviews back home in Japan, have seen him chop and change, from the starting line-up, to the bench or even being frozen out altogether. The year 2015 felt like the last straw, his last attempt at making a name for himself at the Rossoneri, and sadly it looks like it could be his last full year at the club. “It’s more difficult than I imagined it would be at Milan, but of course I won’t give up. Of course I have to accept my disappointing performances, but I have confidence of fighting back. I know it will be difficult to win back my place but I haven’t given up.” – Keisuke Honda, speaking of his frustration back in November. It’s been an up and down year that ended in some slight promise as he started to rack up regular starts under Siniša Mihajlović, but as has been the case throughout his career in Italy, all things look to have come crashing down to earth once more. The rehiring of former Ghana international Kevin Prince Boateng surely will prove the final nail in the coffin, as another player is favoured over Honda when it comes to selection in his preferred number 10 position. While the Asian Cup as a whole won’t be considered as a great success from the Japanese point of view, the group stage showed everything in which Japan and Honda in particular excel in. 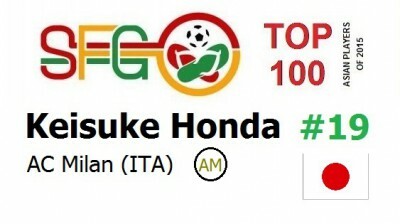 Honda notched three in three, all be it two penalties against Palestine and Iraq (the deciding goal in their second victory), however his third against Jordan, and his overall performance rate over the three matches was of the top order. A late run in at the back post to poke in against Jordan may have not been the most glamourous of goals, not something you’d expect from Honda at all, but it showed his range of ability and his importance to the team’s set up. Wherever he’s been deployed for his country this last year he’s continued to live up to the expectations put upon him. A new club for 2016 however would be a welcome change for a wondrous talent who deserves another chance.